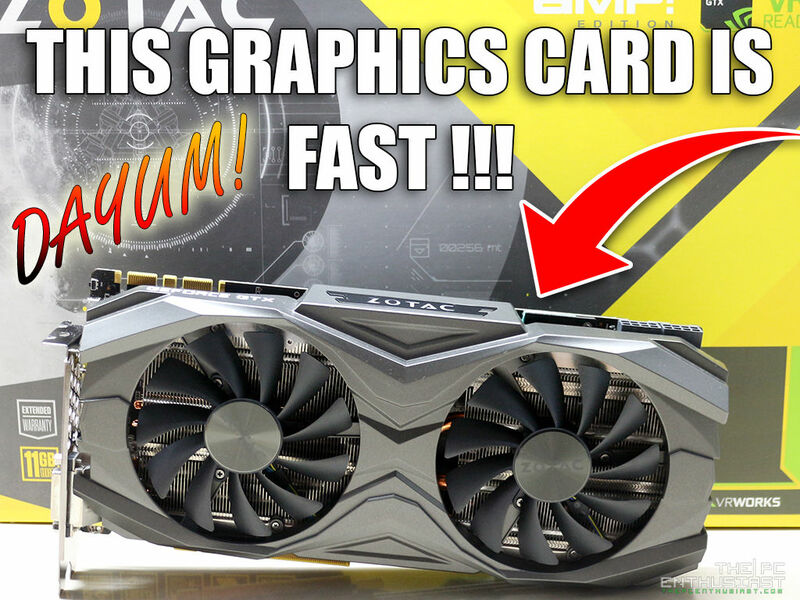 ZOTAC GeForce GTX 1080 Ti AMP Edition Review – Fast and Cool! We know that NVIDIA will release a “Ti” version of the GeForce GTX 1080. It was only a matter of time, and finally it’s here! The GeForce GTX 1080 Ti is currently the fastest single GPU gaming graphics card on the market; having (very) similar specs with the TITAN X (Pascal). Not only that it’s cheaper compared to the TITAN X (Pascal), but in many or most gaming scenario, it even outperforms the TITAN X (Pascal). That’s why NVIDIA released the TITAN Xp. But enough of the Titans, today we are going to look at and review the ZOTAC GeForce GTX 1080 Ti AMP Edition; featuring factory overclock speeds out of the box and great cooling performance without being too thick and bulky. If you are looking for an upgrade and want the fastest graphics card around for 1440p, 4K UHD or (1080p/1440p) high refresh rate gaming, stick around and continue reading our Zotac GTX 1080 Ti AMP Edition review below. This could be the graphics card for you. It’s no surprise to us that a GeForce GTX 1080 Ti will come out soon. In fact, we are expecting this graphics card to come out. It’s also no surprise that it would share similar specifications with the TITAN X (Pascal). NVIDIA has done this before in previous generations. A Ti version would come out after a TITAN graphics card; and they are always priced significantly lower. For PC gamers, the GTX 1080 Ti is definitely the better option than the TITAN card; offering similar or better gaming performance at a more affordable price. To make the GeForce GTX 1080 Ti less of a TITAN, NVIDIA removed 1GB of GDDR5X memory and reduced the memory bus and ROPs from 384-bit to 352-bit and from 96 down to 88 respectively. However, the memory clock speed was increased from 10Gbps on the TITAN X (Pascal) to 11 Gbps. Both the TITAN X (Pascal) and the GTX 1080 Ti features 3584 CUDA cores. But did it made the GTX 1080 Ti performed slower compared to the TITAN X (Pascal)? While we don’t have a TITAN X (Pascal) here to do a side by side comparison, most GeForce GTX 1080 Ti Founders Edition reviews revealed that the 1080 Ti is actually on par or (slightly) faster than the TITAN X (Pascal) in gaming. Now that’s only the Founders Edition, imagine what a custom designed GTX 1080 Ti can do, like the Zotac GTX 1080 Ti AMP Edition we have here. Zotac released five variants of the GTX 1080 Ti (excluding the FE); the GTX 1080 Ti AMP Extreme, AMP Extreme Core Edition, ArcticStorm, AMP Edition and the Blower. The Zotac GTX 1080 Ti AMP Edition features a base clock speed of 1569MHz and boost clock speed of 1683 MHz. That’s around 6% increase right out of the box from the Founders Edition. Meanwhile, the hulking GTX 1080 Ti AMP Extreme Edition boasts a 1645MHz base and 1759MHz boost out of the box, making it the fastest GTX 1080 Ti right out of the box in the market (currently). And like the AMP Extreme version, this AMP Edition also features a 16+2 power phase design. The Zotac GTX 1080 Ti AMP Edition features Zotac’s ICESTORM cooling system with Freeze Fan Stop; PowerBoost and SPECTRA LED lighting system. These are basically marketing terms, when translated to layman’s terms, it means that it features a beefy cooling solution and the fans don’t spin unless it reaches a certain (higher) temperature. According to Zotac “the PowerBoost is a control chip that provides live electrical current regulation and instant electrical deviation responses. It reduces ripple noise and minimizes power fluctuation, resulting in a longer lasting “AMPed” graphics card even in the most demanding situations.” The “ZOTAC” logo on this graphics card has LED lighting (SPECTRA) and you can choose from 7 different colors, not full RGB though. Below is a specifications table comparing the Zotac GTX 1080 Ti AMP, the GTX 1080 Ti Founders Edition and TITAN X (Pascal). Next page, let’s take a closer look at the graphics card itself. Card Size 5.83" x 11.81" 4.376" x 10.5" 4.376" x 10.5"
Thanks for the review. I have just bought it. Waiting to test it.